Probably the best normal route for who aim to approach with the techniques of progression in high mountain. 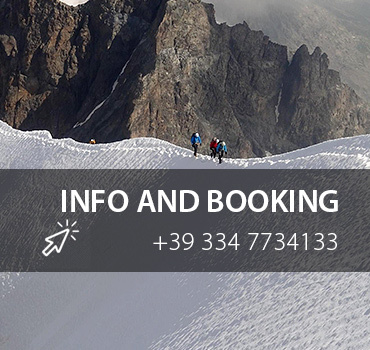 The highest peak in the west Alps, massif and impressive, with it’s ice covered walls offers breathtaking views from any side we observe it. Day 2: With the first lights of dawn we start in S-W direction, crossing the northern face of the Tabaretta peak and overcoming easy rocky steps reaching the climbing wall called Wandln (the harder and more technical par of the whole route). The next step it’s on the ridge and must be done with extreme care because it’s very exposed. The rock steps are finished, we cross a steep slope, often iced, taking to the glacier named “Buca dell’Orso” (Bear’s hole) and then at the Tschierfegg hill, where we find the Lombardi bivouac. The bivouac it’s reached with an ice step(due to the ice melting). The following glacier, full of crevasses with incline up to 35° and in the late season is live ice, takes us to the Ortles plateau and then to the top. Probably the more accessible normal route that allows to test yourself in rock and ice steps at almost 4000m in height. Day 1: Just after Solda’s church following path n°4 with a pleasant walk in a wood of Cirmolo pine, we reach the Marlet glacier, completely covered by debris, we proceed with a steep part of path that in a short time take to the Tabaretta hut (2556 m) great panoramic point. Passed over the hut we go on in direction of the Orso pass (2879 m), mandatory a stop to admire the Ortles glacier and the mountains around the Stelvio Pass. We climb the steep north face of the ridge taking to the Tabaretta Pass (2883 m), and after som exposed but well equipped steps and a last steep part we reach the Pajer hut (3020 m). Day 2: With the first lights of dawn we start in S-W direction, crossing the northern face of the Tabaretta peak and overcoming easy rocky steps reaching the climbing wall called Wandln (the harder and more technical par of the whole route). The next step it’s on the ridge and must be done with extreme care because it’s very exposed. The rock steps are finished, we cross a steep slope, often iced, taking to the glacier named “Buca dell’Orso” (Bear’s hole) and then at the Tschierfegg hill, where we find the Lombardi bivouac. The bivouac it’s reached with an ice step(due to the ice melting). The following glacier, full of crevasses with incline up to 35° and in the late season is live ice, takes us to the Ortles plateau and then to the top. Included in the fee: the Guide service, the technical equipment hire necessary for the activity. Not included in the fee: hut’s half board, personal expenses, guide's expenses,evenctually the cable lift ticket if necessary and all not specified in "included". 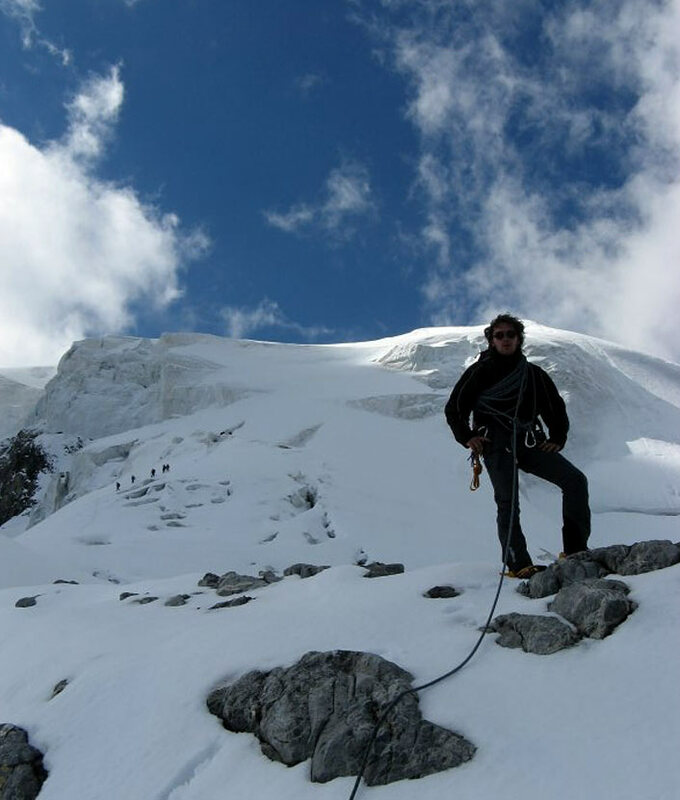 Equipment provided by Mountime: harness and crampons. Personal equipment: Layered mountain sportswear, warm windproof jacket, gloves and cap, sun glasses and suns cream, trekking boots (better if semi-crampon), backpack with water and energetic food. The Hintergrat is a fantastic ridge overlooking the northern slope of the Great Zebru.